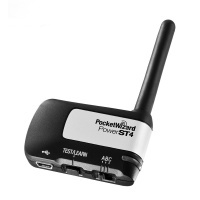 The PowerST4 Receiver enables remote power control of Elinchrom RX flashes using PocketWizard ControlTL technology. With a MiniTT1 Transmitter or FlexTT5 Transceiver on your camera and a PowerST4 plugged into your Elinchrom RX flash, you can now adjust the flash power settings directly from the camera. Add the AC3 ZoneController and you can control three different zones of lights in 1/3-stop increments with up to a six-stop range. Utilize PocketWizard’s unique features such as HyperSync and Optimized Rear Curtain Sync for maximum control of your lighting. 1. Connect the PowerST4 to your RX flash pack via the remote port, then power on the flash. 3. Set up your PocketWizard transmitter and take pictures normally. The Status LED blinks Green every few seconds to indicate normal operation. It will blink Red in sync with a trigger. Momentarily pressing TEST/LEARN will test trigger the flash. See the Learn Mode and Reset sections for more information on those functions. NOTE: The PowerST4 overrides settings you make directly on your flash. If you would like to change the beeper, modeling light, or optical slave mode on your flash, just set those features on your flash before you turn on your camera’s transmitter. You can also adjust these settings from your transmitter via the PocketWizard Utility. See that section for more information. If you would like the flash to simply trigger at the output power you set, and not accept power changes from the radio, follow these steps: Make sure to allow a few seconds between each step! 2. Then press TEST on the PowerST4. 3. Wait a few seconds for 3 amber blinks from the PowerST4's LED. To allow the PowerST4 to control the flash features again, turn the flash OFF and back ON. Note: When receiving on Standard Channels, the PowerST4 will be unable to do any form of PowerTracking, or remote Manual Power Control. You must be using a ControlTL radio in ControlTL radio mode for the Elinchrom flash to be able to engage in any form of ControlTL feature. Having trouble with your PowerST4? Check out our PowerST4 FAQ page! PocketWizard’s newest firmware platform taps into the camera’s digital communications to enable an entirely new level of remote flash capability through our proven radio system. 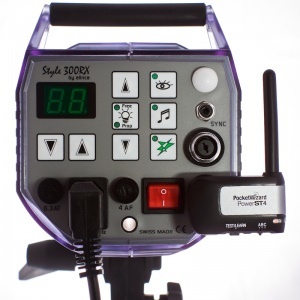 ControlTL allows remote TTL systems as well as Manual Power Control. ControlTL firmware is configurable and upgradeable for “future-proof” continuous improvement. Adjust the manual power settings of your remote Elinchrom flash directly from a AC3 ZoneController, or master flash mounted on your on-camera MiniTT1 or FlexTT5. You can independently control the power output of up to three remote groups of lights (you can have as many lights in each group as you want) from full power down to the lowest setting through the user interface on the back of the master flash or with the dials of the AC3 ZoneController. Now you can work with total control with your remote lights, without leaving your shooting position. Our patent pending HyperSync® technology allows photographers to achieve faster X-sync speeds with full power flash. That extra speed can be used to freeze action or cut ambient light - both of which can produce results never possible before. HyperSync works automatically with the PowerST4. All you need is a MiniTT1 or FlexTT5 on camera to gain the benefits of HyperSync. While performance varies by the camera and flash equipment being used, HyperSync will get the maximum possible out of any configuration. When working with certain manual flashes, you can change any of your settings on your camera and the system adjusts for those settings. Change your camera's exposure compensation to adjust the flash output, or make adjustments in aperture or ISO and the system balances your flash for proper exposure. If you have a ControlTL transmitter like the MiniTT1 or FlexTT5 then you can control your flash’s output level remotely. Add the AC3 ZoneController for even more control. Read the PowerTracking section for more information on using the PowerST4 when no AC3 is present, or when using an AC3 in Auto Mode. The numbers in the table are within +/- 0.1 stops. Use the PocketWizard Utility software with the on-board USB port to program the PowerST4 to any PocketWizard channel and zone as well as many other custom settings. ControlTL radios can be upgraded whenever updates and feature enhancements are available. When using a Ranger RX or Digital RX series pack, make sure to set the flash head in use in the PocketWizard Utility, under the Misc Tab for optimal HyperSync performance. Note: The PowerST4 is not compatible with the Ranger RX Quadra. Use a Plus series radio, MultiMAX, or the P2 port of a FlexTT5 as a receiving radio for that pack. In order to connect to Ranger RX series packs, the PowerST4 requires an Elinchrom female 5-pin to male 7-pin Ranger RX Adapter, (Elinchrom Part # EL 19374). The PowerST4 will connect directly to the 5-pin RX port of Style RX and Digital RX series packs/heads. For longer range performance, and for general use, we recommend the Ranger Remote Cable 8' (Elinchrom Part # EL 11107), or other compatible Elinchrom extension cable. This will allow for raising the PowerST4 antenna above the pack's ground level position, or optimizing reception in other challenging environments like arena cat walks. Elinchrom has discontinued these cables and they are becoming increasingly difficult to find. Michael Bass offers a custom solution. If you own the Elinchrom EL 19342 Hand Remote Set then you can use its cable with your PowerST4. The following Elinchrom cables are not compatible with the PowerST4: EL 11085, EL 11086, EL 11087. Those cables are for older analog Elinchrom Style S packs which are not compatible with the PowerST4. Requirements Must be used in conjunction with a MiniTT1 or FlexTT5 on camera for power control capability. May be paired with any PocketWizard transmitter or transceiver for simple triggering. This page was last modified on 9 July 2015, at 06:44. This page has been accessed 229,830 times.